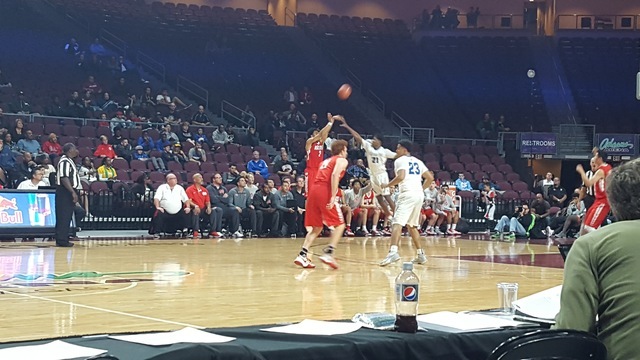 Bishop Gorman saw a nine-point lead fizzle away in the final 4:43 of regulation and went on to lose 86-79 in overtime to nationally ranked Mater Dei (California) in the semifinals of the Tarknanian Classic’s Platinum Division. 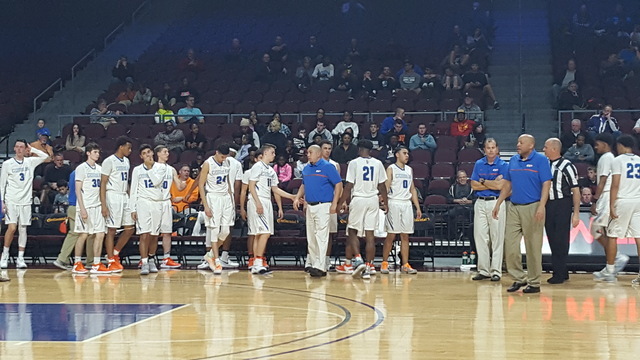 Grant Rice’s message to his Bishop Gorman boys basketball team at halftime Monday at Orleans Arena was to play two complete halves. He even wrote it on the whiteboard. “Maybe I jinxed myself,” the Gaels’ veteran coach said. Gorman saw a nine-point lead fizzle away in the final 4:43 of regulation and went on to lose 86-79 in overtime to nationally ranked Mater Dei (California) in the semifinals of the Tarknanian Classic’s Platinum Division. The Gaels (5-3) will host Roosevelt of Eastvale, California, in the third-place game at 5 p.m. Tuesday. Christian Popoola led Gorman with 24 points, to go along with six rebounds and five assists. Chuck O’Bannon added 17 points, 12 rebounds and six assists for the Gaels, but shot just 3-for-16 from the field. Gorman led by as many as 14 points in the second half and went ahead 69-60 on Jarrett Jordan’s baseline jumper with 4:55 remaining in regulation before Mater Dei responded with a 15-2 run. Popoola made two free throws with 21.7 seconds left to tie the game at 76, and Gorman forced a late turnover, but Jamal Bey’s long 3-pointer at the buzzer didn’t fall. In the overtime, Gorman missed all six of its attempts from the field and never led. Spencer Freedman found Harrison Butler open along the baseline for a layup and an 80-78 lead, and Mater Dei went 6-for-10 from the foul line in the final 1:56 to pull away. Freedman had 19 of his game-high 26 points after halftime, and Justice Sueing added 25 points and 16 rebounds for Mater Dei despite playing the final 15:02 with four fouls. The Gaels made eight of their 11 3-pointers in the first half and took a 41-31 lead into the locker room after Ryan Kiley’s 3-pointer just before the buzzer. Bey’s leaner put Gorman on top 51-37 with 12:26 to go in regulation and the Gaels were up 61-50 when O’Bannon finished off a fast break. But Freedman hit a 3-pointer from NBA range on Mater Dei’s next possession to start the comeback. Windermere Prep (Fla.) 69, Desert Pines 57 — At Gorman, Blake Stillwell scored all 18 of his points in the second half to lead the Lakers over the Jaguars. Trevon Abdullah-Booker had 19 points to lead Desert Pines, which led 31-27 at halftime. Jalen Graves added 14 points for the Jaguars, and teammate Capri Uzan scored 12. Valor Christian (Colo.) 71, Clark 63 — At Gorman, Dylan McCaffrey had 24 points as the Eagles topped the Chargers. Ian Alexander scored 18 points to lead Clark, which trailed 35-20 at the half. Trey Woodbury added 16 points, and James Bridges scored 10 for the Chargers. Harvard-Westlake (Calif.) 73, Coronado 62 — At Gorman, Mason Hooks had five of his eight points in overtime, including a bucket with 2:21 to go that put the Wolverines up for good. Harvard-Westlake led 45-30 with 10:47 to go in regulation before Coronado began to chip away at the lead. Bryce Savoy had four free throws in the final 25 seconds of regulation, including two with eight seconds to go that tied the game at 55. Taieem Comeaux then blocked a shot with two seconds left to keep the game tied and force overtime. Johnny Juzang scored 22 points, and Cassius Stanley had 17 points, nine rebounds and four assists to lead the Wolverines. Will Weems had 17 points and 12 rebounds to pace the Cougars. Kennedy Koehler added 17 points and seven rebounds, and Trey Hurlburt scored 12 for Coronado. Capital Christian (Calif.) 73, Durango 68 — At Desert Oasis, Austin Alexander scored 22 points, and teammate Micah Filer hit four of the Cougars’ eight 3-pointers in a win over the Trailblazers. Filer finished with 14 points. Vernell Watts led Durango with 15 points. Nicquel Blake scored 13, and Zyare Ruffin and Demetrius Valdez each added 11 points for Durango. ThunderRidge (Colo.) 67, Las Vegas 56 — At Orleans Arena, Marquise Raybon had a team-high 14 points, but battled foul trouble in the Wildcats’ loss to the Grizzlies. Deondre Northey had 10 points for Las Vegas, which will play Woods Cross (Utah) in the third-place game at 2:20 p.m. Tuesday at Bishop Gorman. Raybon had 10 points in the first half despite three fouls and picked up his fourth early in the second half, forcing him to sit for the next six-plus minutes. ThunderRidge took advantage, turning a 38-32 halftime lead into a 55-42 lead on Corey Seng’s midway through the second half. The Wildcats didn’t get closer than nine points the rest of the way, the final time coming on Josh Valencia’s 3-pointer that cut ThunderRidge’s lead to 65-56 with 48.5 seconds remaining. Valencia made three of Las Vegas’ nine 3-pointers and finished with nine points. Seng posted a game-high 23 points and scored nine straight ThunderRidge points during a four-minute stretch in the second half. Doug Maier made four first-half 3-pointers and had 14 points, and Ryan Holt added 14 points for the Grizzlies. Palo Verde 68, Legacy 42 — At Faith Lutheran, Cole Hendershot scored 16 points, and the Panthers stormed to a 25-16 halftime lead before routing the Longhorns. Brian Sullivan had 10 points, and Tieman Allen scored nine for Palo Verde, which got scoring contributions from 10 players. Chris White led Legacy with eight points. Villa Park (Calif.) 76, Sierra Vista 69 — At Faith Lutheran, Maka Ellis led all scorers with 31 points in the Mountain Lions’ loss to the Spartans. Chris McCoy added 15 points, and Maui SeraJosef scored 11 for Sierra Vista. Myles Franklin scored 27 of his 29 points in the second half to lead Villa Park. Caleb Banuelos had 14 points for the Spartans. Desert Vista (Ariz.) 71, Faith Lutheran 57 — At Faith Lutheran, Jaylen Fox and Josh Hong each scored 14 points in the Crusaders’ loss to the Thunder. Nic Maccioni added 12 points, and Elijah Kothe scored 11 for Faith Lutheran, which was outscored 36-22 in the second half. Westley Harris led Desert Vista with 27 points. Noah Bauman had 16 points, and Caleb Simmons notched 13 points for the Thunder, who made 20 of 23 free throws. Shadow Ridge 93, Spring Valley 74 — At Desert Oasis, James Fuller poured in 38 points as the Mustangs beat the Grizzlies. Shadow Ridge’s Bricin Ford scored 17 points, Kevin Branch had 16 points, and Isaiah Williams scored 15. Keelan Wickersham and Ryan Frazier each scored 21 points to pace Spring Valley. Justin Bonner scored 14 points for the Grizzlies. Liberty 77, Desert Oasis 60 — At Desert Oasis, Braden Cain scored 16 points to lead the Patriots to victory over the Diamondbacks. Liberty’s Jordan Holt scored 14 points. Dyllan Robinson added 13 points, and Cameron Burst scored 12 points for the Patriots. Desert Oasis’ Jacob Heese led all scorers with 23 points. Taiga Miyano scored 15 points for the Diamondbacks. Campbell County (Wyo.) 65, Green Valley 50 — At Desert Oasis, Trey Hladky and Lane Tucker each scored 16 points as the Camels defeated the Gators. Hunter Hitchcock led Green Valley with 11 points. Michael Jackson and Matthew Tuttle each added nine points for the Gators, who trailed 37-13 at the half. Agassi Prep 60, Mojave 47 — At Faith Lutheran, Akeemis Williams hit seven 3-pointers and finished with 25 points to lead the Stars past the Rattlers. Allen Merritt scored 16 points — all in the second half — for Agassi Prep, which also got nine points from Daniel Plummer. 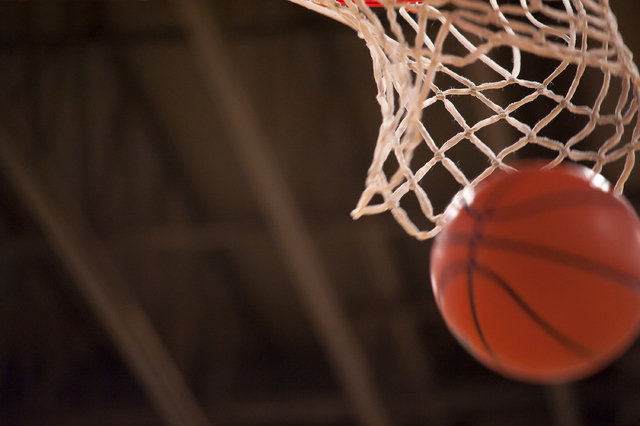 Tyrice Pender had 16 points, and Tyrique Watson added 10 points for Mojave. Price (Calif.) 47, Western 34 — At Faith Lutheran, Kwan Carter scored 12 points in the Warriors’ loss to the Knights. Anthony Dodson had eight points for Western. D’Andre Payne led Price with 12 points, while teammates Ely Tom and Kylyn Dirks each scored 10. Cheyenne 54, Lincoln (Colo.) 45 — At Faith Lutheran, Kavon Williams scored a game-high 17 points to lead the Desert Shields by the Lancers. Dewayne Alexander added 12 points, and Keshawn Hall scored nine for Cheyenne, which led 24-23 at halftime. Moses Hughe led Lincoln with 13 points, and teammate Ty Foster notched 10 points. Coral Academy 73, Lehi (Utah) 71 — At Faith Lutheran, Zack Hammer led four double-figure scorers with 19 points as the Falcons rallied by the Pioneers. Isaiah Spears had 18 points, and Isaac Spears scored 15 for Coral Academy. Teammate Ryan Djino added 14 points for the Falcons, who trailed 39-28 at halftime. Ethan Tuckett led all scorers with 20 points for Lehi. Dallin Holker had 18 points, and Kevin Winsor scored 14 for the Pioneers.